Hi everyone! I’m stopping by to share a second card I made for Winnie & Walter. This one is a modern yellow Valentine’s Day card. And by the way, if you missed my first post, you can find it here. For this project I used the Scenery: V for cheVron set to stamp and color the chevron background. I simply repeated the medium sized chevron to create a pattern and colored it in using the matching solid stamp. To tone the background down a bit I added a layer of thin vellum. I stamped and cut out a heart and an envelope using the You’ve Got Love Mail set. I used black ink for both and colored the envelope in using Copic markers. I stamped additional images onto the heart and the vellum to create a realistic postmarked look. 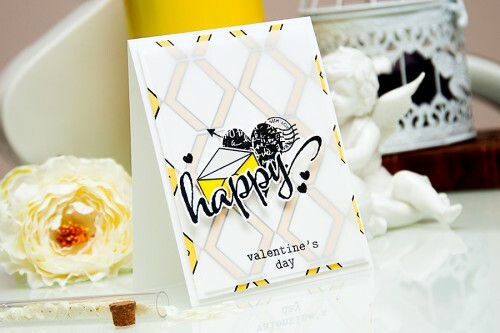 Finally I stamped and cut out the word HAPPY using a The Big, the Bold, and the Happy set. Be sure to stop by Winnie & Walter’s blog to see amazing projects using their products. 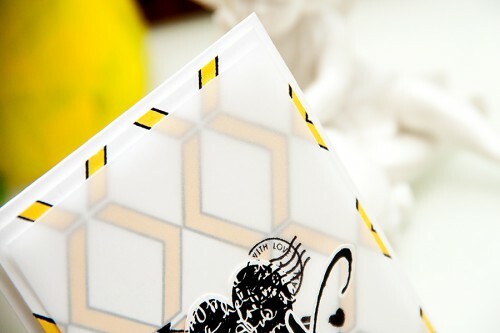 They have a fantastic team of designers that are sure to inspire you! Love, love, love the card! So unique. Would love to see you do this card in a video and see how you get the images lined up. thank you, Rebecca! 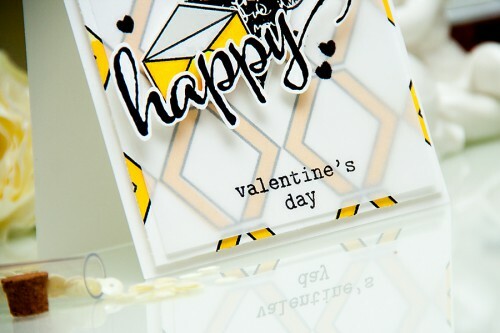 Its not as hard as it looks – first I drew horizontal and vertical pencil lines and those guided my stamping. Some of the images are not aligned perfectly, some go over the lines and I kind of like it that way. Makes it a bit more artsy I guess. Love this bold color, a unique creation! 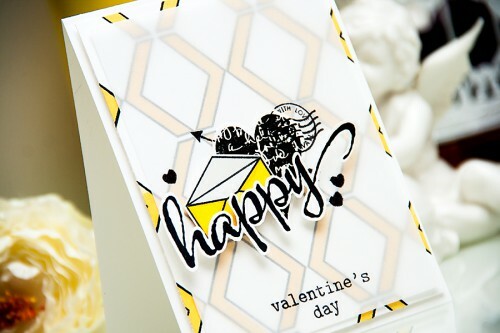 Love how you extended those chevrons in a unique pattern with a beautiful stamped heart! Wanna loooove it!!! !